Canyon Creek Art - Dancing Shadows" won First Place! Dancing Shadows" won First Place! In 2009 the North Texas Business Council for the Arts and EDS (Electronic Data Systems) sponsored an OMOT (On My Own Time) Art Exhibit. 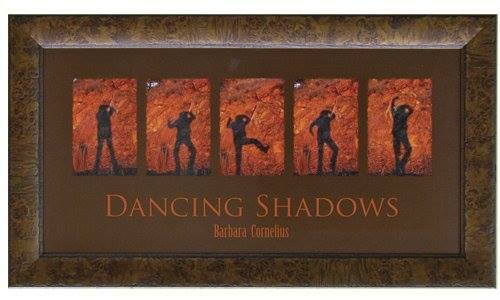 Barbara's "Dancing Shadows" won First Place! This piece is a compilation of 5 photographs was taken by Barbara Cornelius (me) at Jed Johnson Lake in the Wichita Mountains Wildlife Refuge. The sun was rising in the East and hit the red Oklahoma rock - so I started shooting my shadow on the rock. If you will notice, my left arm is always raised .... it's the one holding the camera taking the shot.